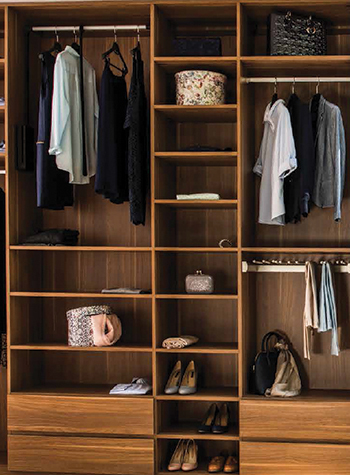 Creative Closets, a pioneer in introducing the smart closet concept in the Middle East, will be showcasing its innovative products on a larger and elegant stand at gulfInteriors this year, confident of receiving a good response to its participation. At the show, the company will be unveiling a new collection of products that will showcase its new colour and texture choices, new wood lines as well as a new range of sliding door profiles and accessories for its closets. Established in 1997, Creative Closets has over the years become one of the most reputable and best recognised names in the market for customised home storage and organisational systems in the region. “Over 50,000 users in Saudi Arabia, the UAE, Bahrain, Lebanon, Qatar and Egypt attest to the high quality of our products and service. We are, by far, the region’s leading specialised manufacturer of contemporary household storage solutions,” says Shaltout. Today, it operates 15 showrooms and four production facilities in six countries across the Middle East, including Saudi Arabia, the UAE, Qatar, Bahrain, Lebanon and Egypt. Creative Closets specialises in bespoke household storage systems. Its product range includes closets, wardrobes, bookcases, TV cabinets, pantries, and any other fixed household storage system excluding kitchens. He says there are three major stages in any storage system project: design, production, and installation. “The design function is an interactive process between the client and us. This starts with a meeting where one of our designers gathers information related to the space available for the storage system, its purpose, and any other relevant information on the project,” Shaltout explains. Over the years, Creative Closets has developed its production process into a systematic and efficient operation. The work involved in executing a project is broken down into well-defined sets of tasks each handled by a specialised team member. The turnover volumes generated by Creative Closets enable it achieve this economically and effectively. “In 2008, we launched our customised ERP (enterprise resource planning) system. Today we think it’s the best in the industry. This year, our ERP and design software package will both be linked to our CNC (computerised numerical control) production equipment, taking us to yet a new stage in our development process. This ensures a very high quality of finishing,” explains Shaltout. He says the company uses machines that were supplied by some of the best companies in the field – Homag and Altendorf, among other world-recognised names. “Our design-patented automatic curved-panel edge-banding machine is probably the first installed in the Middle East and was one of less than 50 installed all over the world (2013),” he adds. Standard wood partitions and shelves are made of 18-mm-thick high specification medium-density fibre-board (MDF) or particle board. The client can choose wooden sheets from Egger, a reputable Austrian company, or from Cleaf, an Italian manufacturer of luxurious panels. Other quality suppliers include Sonae of Portugal and Kastamonu of Turkey. “Even the best wood and drawers can fail if the wrong hardware is used to connect them. We therefore use the best hardware suppliers to ensure that all internal components are connected and mounted in accordance with the highest standards,” Shaltout says, adding that the hardware is sourced from Hettick, Blum and Hafele, three of the best known names in their field. Speaking of sliding doors, he says these have become very popular with closets and as room dividers. They are elegant and practical and can be designed with any of a numerous variety of inserts to complement all wood finishes, he adds. Creative Closets partners with two of the best companies in the field: raumplus of Germany, and Sogal of France. As an icing on the cake, all Creative Closets products come with a 10-year warranty and are backed by its customer care division and maintenance team. This warranty will be passed on to future owners, if the project is sold in total or in part. The company has supplied its products to major housing complexes, hotels and furnished apartments, hospitals, chalets, airports, palaces, government agencies and embassies in the region. Among its largest projects last year was the California Compound in Riyadh, Saudi Arabia, where it supplied some 1,592 closets. Other projects include the Adex Compound in Riyadh, where 200 units were installed and Jubail Development Company Villas in Dammam (70 units), both in Saudi Arabia; Al Hassan Villas Compound (20 units) and Kadi Properties Hotel Apartments (200 units) in Bahrain; and Arnaout Building in Beirut, Lebanon (64 units). Creative Closests is at Stand 2B19 at gulfInteriors.